"As a dad, I will never forget the walk from the waiting area to the recovery room to see my son," said Scott. Nicholas was a happy two-and-a-half year old boy when his right elbow started hurting. Initial X-rays looked normal, but the pain continued to get worse and soon a lump became visible in Nick's forearm. A biopsy revealed that the mass was malignant, a diagnosis Nick's parents didn't expect to hear. "Finding out your child has cancer feels like an emotional knockout punch," said parents, Scott and Jade. Nick was diagnosed with a malignant extrarenal rhabdoid tumor, a highly aggressive form of cancer that requires an equally aggressive treatment. 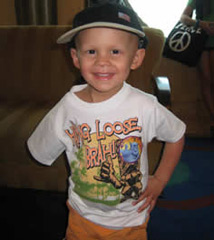 Nick immediately began ten rounds of chemotherapy. After three very difficult rounds that each required hospitalization, Scott and Jade were forced to face the cancer&'s most difficult challenge. In order to completely remove the tumor, Nick's right arm had to be amputated above the elbow. "As a dad, I will never forget the walk from the waiting area to the recovery room to see my son," said Scott. "It's difficult to describe the emotions during that walk. An odd excitement that the tumor was gone, and a heavy sadness for what my son had to sacrifice." But Nick showed amazing resiliency even after the amputation. To his parents' amazement, Nick was smiling, eating and watching Barney only hours after the surgery. "His strength became ours and his cheerfulness lifted our spirits. Nick's "business as usual" demeanor when we took him home from the hospital comforted us," said Scott. After completing the rest of his chemotherapy treatment with minimal complications, the Colley family recognizes the struggles they have overcome and hope to offer insight and comfort to others battling childhood cancer. "There is a flood of emotions and despair, but the moment of clarity will arrive," said Scott. "We feel the pain of these families and see how fortunate Nick has been to emerge as a 'survivor.'" Nick periodically undergoes CT/MRI surveillance scans that will decrease over time. To date, all of his follow-up tests have shown no spread of disease. With the help of his prosthetic 'helper arm,' the three-year-old happily spends his time swimming, collecting bugs and playing with sister, Camilia. Nick is only three years old, but he has already learned how to endure hardship with a smile, something he's taught his parents as well and a lesson that benefits us all.